Another unfamiliar item arrived in my CSA box last week. When I opened our box of exciting new discoveries, I was greeted with a green that looked something like cilantro meets arugula. I took a bite of a leaf and was met with a flavor similar to arugula but much milder. Our accompanying list of items told me that I was chewing on something called mizuna. To cook Chinese Vermicelli noodles, boil in water for 10-15 minutes and drain. 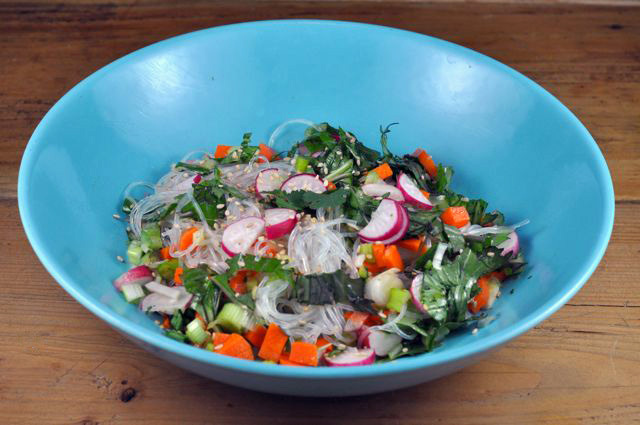 Combine Mizuna, cilantro, carrots, scallions, radishes, and noodles in a large bowl. In a separate bowl, combine garlic, ginger, oil, soy sauce/brags, and lime. Whisk together and pour over noodles. This entry was posted in Recipes and tagged breakfast radsh, carrots, cilantro, garlic, ginger, lime, liquid aminos, mizuna, scallions, sesame oil, sesame seeds, vermicelli.